Tidewater Community College’s David Warren has been selected by the Virginia Community College System (VCCS) as an inaugural recipient of the George B. Vaughn Award for Outstanding Adjunct Faculty. Warren joined the college faculty in 2002 after retiring as choral director with Portsmouth Public Schools. At TCC, he added chorus classes, including the history of chorus. In addition, he teaches classes in voice and organizing and directing choral activities. The award is named for George B. Vaughan for his distinguished service of over 40 years as a national leader in community college education. The award serves as a legacy of Vaughan’s achievements and as an inspiration for VCCS faculty. Warren is one of five adjunct professors honored statewide. The awards were presented by VCCS Chancellor Glenn DuBois at the First Year Faculty Seminar & Adjunct Faculty Institute on Nov. 17 in Glen Allen, Va.
“David embodies the essence of this award inspired by Dr. Vaughan,” said Daniel DeMarte, TCC’s vice president for academic affairs and chief academic officer. “He demonstrates his commitment to providing students a quality learning experience, adapting to their individual needs, and giving them outstanding support in keeping them on track to succeed. TCC Chorus is recognized by the college community for its excellence and has performed at many college events, including President Edna V. Baehre-Kolovani’s inauguration in 2013. Under Warren’s direction, TCC Chorus presents public concerts at the end of each semester. The group premiered a new choral work, “Eternal Life,” by local composer Elizabeth Atkinson, at its 2015 fall concert. Warren facilitated the composition of a commissioned work for TCC Chorus, “Three Meditations on Poems by Emily Dickinson,” composed by Bruce Frazier from Western Carolina University. The pieces premiered in spring 2014. 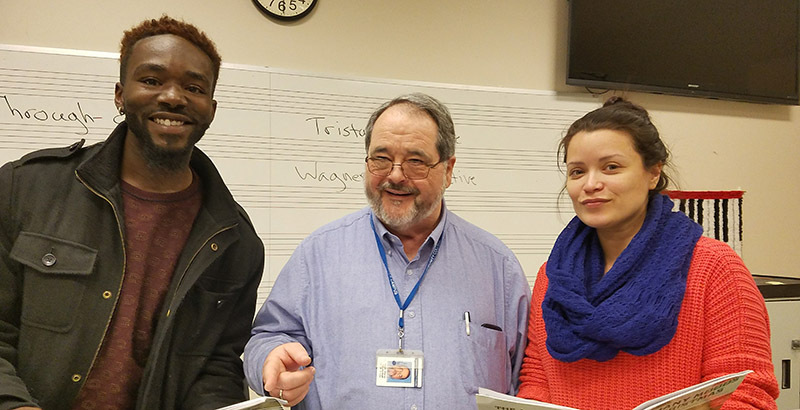 Warren worked with staff of Virginia Wesleyan College to produce a joint concert in 2014. The groups presented “Requiem” by John Rutter, a major choral work with chamber orchestra. He currently serves as Southern Division Repertoire & Resources Chair for Two-Year Colleges with the American Choral Directors Association. He is also a member of the National Association of Teachers of Singing, Association of Choral Music Education, VoiceCare Network and National Education Association. Warren grew up in Burlington, N.C., and was inspired by his high school chorus director to pursue music. He holds a bachelor’s in music education with an emphasis in chorale music from East Carolina University. He resides in Olde Towne, Portsmouth.